Consider your own values and circumstances. When thinking about the pros and cons of a treatment, don’t forget to consider its impact on your overall life. For instance, will one of the side effects interfere with a regular activity that means a lot to you? Is one treatment choice expensive and not covered by your insurance? Doctors need to know about these practical matters so they can work with you to develop a treatment plan that meets your needs. Are there other treatments available? How much will the treatment cost? Will my insurance cover it? 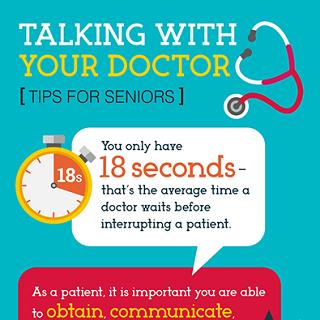 Read and share this infographic for tips on how seniors can effectively communicate with their doctors. Doctors and other health professionals may suggest you change your diet, activity level, or other aspects of your life to help you deal with medical conditions. Research has shown that these changes, particularly an increase in exercise, have positive effects on overall health. Until recently, preventing disease in older people received little attention. But, things are changing. We now know that it’s never too late to stop smoking, improve your diet, or start exercising. Getting regular checkups and seeing other health professionals, such as dentists and eye specialists, helps promote good health. Even people who have chronic diseases, like arthritis or diabetes, can prevent further disability and, in some cases, control the progress of the disease. If a certain disease or health condition runs in your family, ask your doctor if there are steps you can take to help prevent it. If you have a chronic condition, ask how you can manage it and if there are things you can do to keep it from getting worse. If you want to discuss health and disease prevention with your doctor, say so when you make your next appointment. This lets the doctor plan to spend more time with you. As with treatments, consider all the alternatives, look at pros and cons, and remember to take into account your own point of view. Tell your doctor if you feel his or her suggestions won’t work for you and explain why. Keep talking with your doctor to come up with a plan that works. Many doctors now recommend that older people try to make physical activity a part of everyday life. When you are making your list of things to talk about with your doctor, add exercise. Ask how exercise would benefit you, if there are any activities you should avoid, and whether your doctor can recommend any specific kinds of exercise. Start exercising with NIA’s exercise and physical activity campaign, Go4Life®, developed specifically for older people. Is there any way to prevent a condition that runs in my family—before it affects me? Many people search online to find information about medical problems and health issues. However, not all health information on the web is of equal quality. Read about how to find websites that are accurate and reliable. Don’t forget to talk with your doctor about what you’ve learned online.